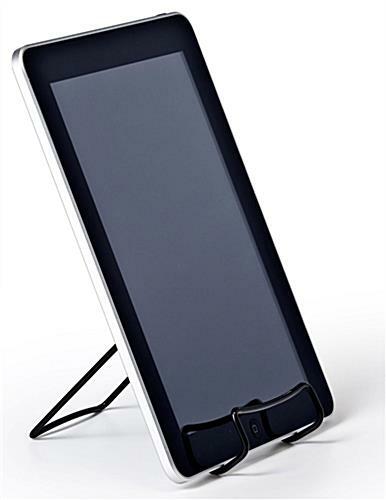 This Cheap iPad Stand is Priced to Sell! The Counter Holder is Designed to Display Virtually Any Tablet! Sometimes, you just need a quick and easy way to set up your tablet for hands-free viewing. This cheap iPad stand for table or counter use certainly fits the bill in form and function. Not only is it fully adjustable, it's also fully affordable. Use this cheap iPad stand for reading a cooking recipe, reading guitar tabs, or to simply watch your favorite TV shows or movies. The important factor to remember in all of this is your hands are free to perform activities while viewing. With the addition of our cheap iPad stand, also called a tablet mount or iPad holder, following instructions or other procedures has never been easier! The bottom support lip is generously sized so the Apple® accessory holder can accommodate virtually any tablet available on the market. The cheap iPad stand features a foldable design. The two support legs come in short and long lengths, depending on your application. Use the longer leg of the cheap iPad stand for portrait format. The shorter leg is recommended for landscape use, or you can even bend both legs in the down position to achieve the lowest height. You have the freedom to bend the tablet mount into any configuration. The cheap iPad stand that folds flat can be tucked away in a bag or drawer. 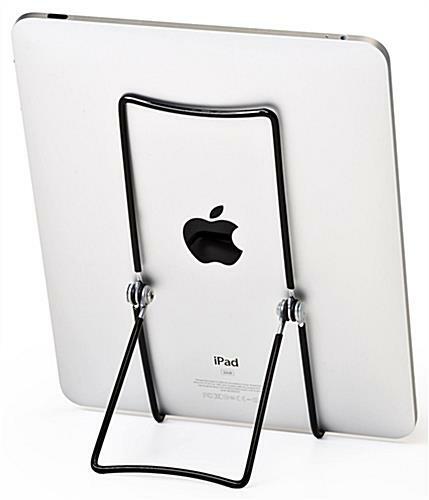 This tablet holder accessory is constructed with a wire frame which is coated in black nylon plastic. This prevents scrapes or scratches on your investment. 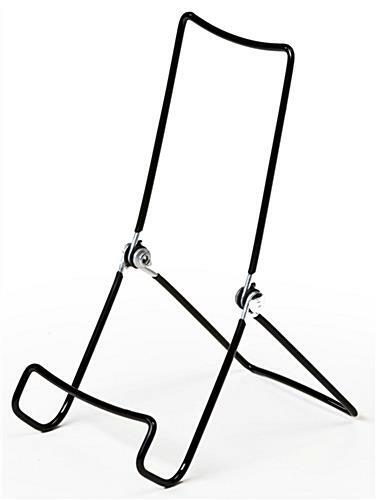 Due to it's low price, this cheap iPad stand is sold in sets of 12 units. Buy a couple for yourself and give the rest as gifts to family and friends!